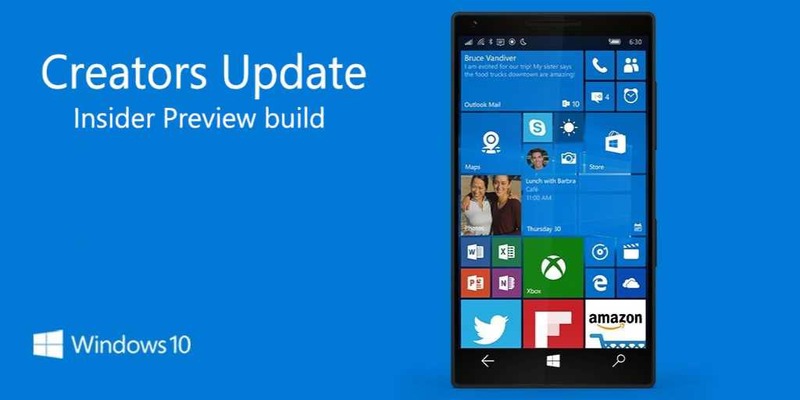 Windows 10 Mobile Build 10.0.15025.1001 released with bug fixes and improvements. Windows 10 Mobile build 10.0.15025.1001 is now available. Recently, Microsoft released Windows 10 Insider Preview PC Build 15025 but skipped mobile build because of bug that impacts their ability to release the mobile build. However, Windows 10 Mobile build 10.0.15025.1001 is now available for Fast Ring Insiders. The latest build brings new features, improvements, and other fixes. Previously, the company released Windows 10 mobile 10.0.15014.1000 for insiders. If you are facing Error 80080008 with build 15025, Read here for the workaround. Introducing Collections in Feedback Hub: Windows 10 Mobile build 10.0.15025.1001 brings Collections. Collections are now live in Feedback Hub starting with app version 1.1612.10251.0. Windows 10 Mobile build 10.0.15025.1001 fixed an issue resulting in the Outlook Mail and Calendar tiles sometimes no longer updating for some Insiders until the tile had been resized. Windows 10 Mobile build 10.0.15025.1001 fixed an issue where insiders with certain devices, such as the Lumia 635 and 636, might not have been able to manually change the brightness. Windows 10 Mobile build 10.0.15025.1001 fixed an issue where the Quiet Hours quick action button in the Action Center wasn’t working in recent builds. fixed an issue where notifications using stylized icons had an unexpected amount of padding underneath for high-DPI devices. fixed an issue where receiving a new email notification and tapping on it to open the message wouldn’t open the Mail app or message. App developers can now request to pin their primary tile, just like secondary tiles, allowing apps to highlight their awesome live tiles. We fixed an issue where on some Lumia phones, such as the Lumia 950, there was no dimming prior to the screen turning off. fixed an issue where pressing the Print Screen key on the keyboard in Continuum wouldn’t take a screenshot of the second display. fixed an issue where preview thumbnails weren’t appearing as expected in the task switcher when using Continuum. fixed an issue impacting apps written for Windows Phone 8.1, where they might crash if certain types of dialogs were open in the app and the touch keyboard came up. Windows 10 Mobile build 10.0.15025.1001 improved battery life when OneDrive or similar tasks are running in the background. Windows 10 Mobile build 10.0.15025.1001 fixed an issue where the Cortana live tile would appear blank and not showing the Cortana icon for some languages. Windows 10 Mobile build 10.0.15025.1001 fixed an issue where pressing the mic button in Cortana, and then immediately pressing the Go button on the keyboard, would result in an “I can’t hear anything” error, rather than speech input being cancelled and a search performed. Fixed an issue where the description for the new Apps section of Settings referred to desktop settings rather than mobile ones. Fixed an issue where the touch keyboard wouldn’t dismiss after pressing enter when doing a search on the Apps & features Settings page. Fixed an issue where Settings might sometimes appear blank except for the search box (until it had been closed and reopened). Windows 10 Mobile build 10.0.15025.1001 fixed an issue where the Settings gear would appear pixelated on high-DPI devices when Settings was pinned to Start. Windows 10 Mobile build 10.0.15025.1001 fixed an issue where Settings might hang and then crash after tapping on “Fix Me” or “Start\Stop Insider preview Builds” on the Windows Insider Program Settings page. Fixed an issue where Settings would crash on the Sign-in options page if you tapped “I forgot my pin”, set it up again, then tapped “remove”. Fixed an issue where a string saying SystemSettings.ViewModel.SettingEntry was unexpectedly displayed on the Narrator Settings page. Fixed an issue that could result in the Messaging app icon on the lock screen sometimes appearing as a red X as opposed to the expected message bubble. Fixed an issue resulting in videos captured with the Camera app unexpectedly appearing with a greyed-out thumbnail in Photos. Fixed an issue on recent builds resulting in cellular connectivity sometimes unexpectedly not working after a reboot for Insiders on certain cellular networks. Fixed an issue with certain connected Bluetooth peripherals resulting in Groove Music not resuming playing music after ending a Skype call. Fixed an issue resulting in the Podcast app being muted after the app had been suspended. Fixed an issue resulting in Narrator not being able to read the list of possible tones that could be picked from ringtones when selecting an alarm tone in the Alarms & Clock app. Speech packs will be unable to download on Windows 10 Mobile build 10.0.15025.1001. In Windows 10 Mobile build 10.0.15025.1001 adding a new card / paying with an existing card will not work in Microsoft Wallet. Microsoft is also testing Windows 10 cumulative update build 14393.805 for PC and mobile build 10.0.14393.805. Recently, Windows insider team also released Update KB3216755 build 14393.726 for PC and Mobile build 10.0.14393.726 for Release Preview Ring members. Finally, Windows 10 build 15002 ISOs are now available for download. You can download ISO from here. The company will release Windows 10 Creators Update in April 2017. Microsoft will also release Redstone 3 later this year and Redstone 4 next year. For more details check out below posted links.